Knit Aid for a glamping and knitting weekend away in the beautiful British countryside. 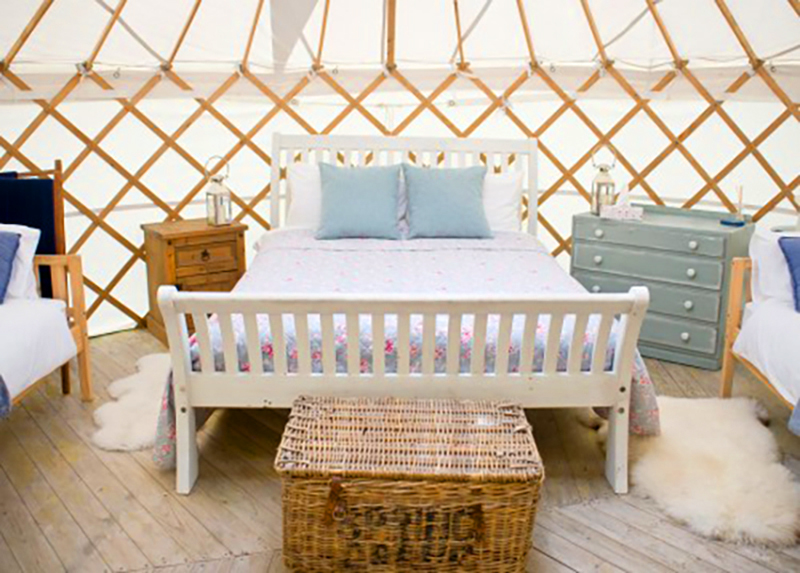 Sleep in a fully fitted-out canvas bell tent with mattresses or yurts with single and double beds and wood burners. Book entire tents and yurts for you and your friends, with limited tents for single ticket holders sharing with others. All sleeping options come with the added luxury of hot showers and toilets nearby, accessible kitchen to make yourself a cuppa, and covered eating areas. 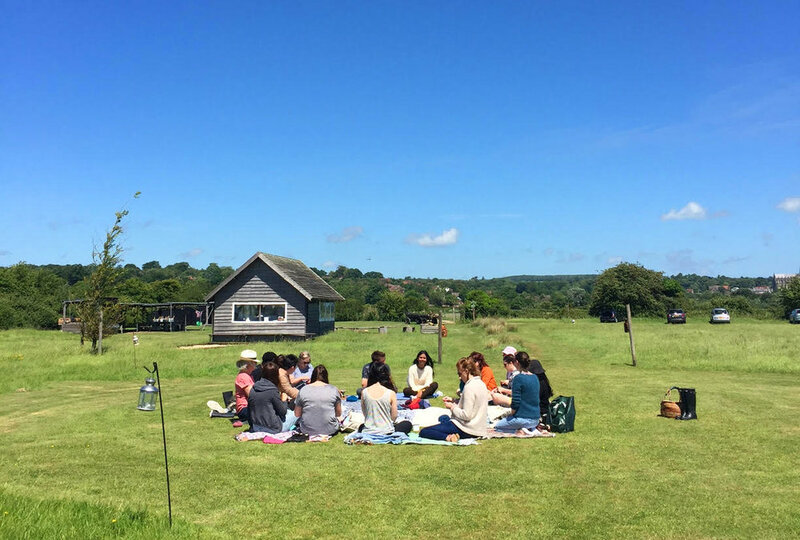 All in the surrounds of 650 acres of countryside at BillyCan Camping in West Sussex. Knit to your heart’s content, dine under the night sky, toast marshmallows on the communal camp fire and wake up to stunning views. Bring your current knitting / crochet project with you or purchase a Knit Aid Kit with your ticket. The kit includes a pair of our exclusive Knit Aid 8mm needles, 100% wool yarn and our fingerless gloves knitting pattern (2/5 difficulty). Knit for yourself or for a refugee – it's up to you. We will be collecting handmade donations at the end of the weekend, should you wish to donate. Learn more about the work we do with refugees through talks by Knit Aid & guests and Q&As. Plus, we'll have workshops including skill-sharing, finger knitting, and more! We'll have a loose schedule over the weekend but with plenty of time to knit, relax and enjoy great company. During your stay, you'll enjoy delicious food, freshly made and locally supplied. A breakfast hamper on the Saturday and Sunday morning. A homemade camp-side welcome supper on Friday evening. Marshmallow toasting by the communal camp-side fire. Your dietary requirements are taken into consideration. Tickets are sold as entire tents and yurts (maximum 4/5 people per tent/yurt) so are most suitable for group bookings. Looking to Glamp & Knit with us on your own? We've got you covered. You won't feel like you're on your own for long! We have availability for single tickets to share tents with other single ticket holders, but these are limited so book quickly! 12pm + – The beach! You are free to knit at anytime during the programme! The nearest convenient station for most major links is Arundel train station. There are regular trains from London Victoria and London Bridge direct to Arundel station, and take approximately 1hr 25mins. You can get a cab from the station which takes around 5 minutes to our camping site, and will cost around £7 for a 4-seater car. For cabs try Castle Cars, who are located at Arundel station. You can also book in advance by phone or on their website. Please quote 'Billycan Camping Site' and not 'Knit Aid' as they will recognise the camping site location name. The campsite is clearly marked on Ford Road with a sign indicating 'Billycan'. There is plenty of parking on the campsite to leave your vehicle for the duration of your stay.